WASHINGTON — An unmanned Army surveillance blimp broke loose from its ground tether at a military base in Maryland on Wednesday and drifted over central Pennsylvania as two Air Force fighter jets tracked it. 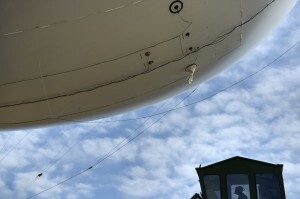 The blimp’s long tether snapped power lines, causing outages. Pentagon officials said the blimp was descending. The North American Aerospace Defense Command in Colorado said the blimp detached from its station at Aberdeen Proving Ground, Maryland, at about 12:20 p.m., and initially traveled north at an altitude of about 16,000 feet. State police in Columbia County, Pennsylvania, confirmed they had been getting 911 calls about blimp sightings, but they could not provide additional details. Witnesses reported seeing the blimp drifting between Jerseytown and Turbotville, a sparsely area north of Harrisburg. Its tether was snapping power lines. FAA officials were working with the military to ensure air traffic safety.